Civilization lies at the roots of mountains, beneath the hills, and in dangerous outposts by the sea – nestled as deeply within the sheltering depths of the atmosphere as possible. Men dig deep, and seal their doors with stone and iron, or else forsake advancement to live in small, tribal, groups, scattered in the wilderness. That’s because concentrated magic and heavy elements – the agricultural blessings which support large populations, the priestly spells which bring healing and comfort, the wards which hold back the restless dead, the enchanted blades which pierce the adamantine hides of monsters, and all the other technology of magic which underlies civilization in a magical world, as well as coinage and heavy metals such as gold and platinum, also draw down the Great Beasts. Stars burn like candles against the infinite night, their worlds huddled close to the warming fires. There, shielded by thin veils of atmosphere, life swarms – tiny beings who need not husband their life forces against the endless drain of the void and eons of time. Beings with frail and short-lived forms, who burn through their energies with abandon, to make room for new generations. Beings who can afford to invest the stuff of their lives in enchantments and sorceries. And those resources of power and enchantment are what call to the elder beings that live in the infinite depths. They are creatures of the airless depths of space, of freefall and radiation, and of rock, metal, and nuclear fire. Only the greatest – eons old, mountainous, and filled with power – can drift down through the smothering layers of atmosphere to almost touch a planetary surface and still return to the freedom of space. Middling-sized creatures, a mere few thousand feet to a few miles across, must orbit, and work from afar – while the least such beings, such as the plasma dragons and fusion “sharks”, must content themselves with those few morsels which depart the hostile depths of gravitational wells to visit the shallows of space. Intermediate and greater beings rarely “attack” directly however. To do so is to almost certainly destroy the very resources they seek to harvest: instead they dispatch tiny constructs – organelles or insignificant remotes from their viewpoints, terrible monsters from the viewpoints of planetary creatures – to gather what they seek. From a planetary point of view, a contingent of horrific monsters descends upon a city (or upon a party of magic-rich adventurers) and attacks. People flee or seal their doors, and retreat into the depths, for they too need the resources the creatures seek to survive against the mundane hazards of the world. Thus ancient artifacts are things to be stored in warded vaults, hopefully safely hidden from the unnatural senses of the elder ones, to be taken out and used only rarely, with trepidation. Heaps of treasure and magic molder in ancient ruins deep beneath the ground, too deep to be easily sensed by the Great Beasts, and guarded by swarms of undead and waiting construct-horrors of imperishable metal and stone, waiting only to be disturbed to awaken – either to be defeated or to add the bones and equipment of more adventurers to their hordes. Powerful mages and priests cast spells with caution, and limit the use of their powers, while their friends avoid carrying masses of magical equipment or developing mystical abilities lest they draw the attention of the horrors from beyond the circles of the world. A realm built upon magic, a powerful mage’s tower, even a party of adventurers with mighty innate powers… all are far too likely to draw attack. Lower-level adventures usually revolve around bandits, intrigue, searching the uppermost – and thus safest – levels of fallen refuges, and the lesser (and generally non-magical) planetary creatures. Mid-level adventures involve exploring the deeper levels of old refuges where the most deadly undead and harvest-constructs may yet linger, defending cities against casual raids, mundane travels, and local politics. High-level adventures may involve defending cities against determined raids, clearing entire refuges of stray horrors, braving the dangers of seeking hidden magical objects – and attempting to locate, bond, and train a Syfann, so as to battle the Great Beasts in their own realm. The Syfann are seal-like, quite intelligent for animals, and telekinetic – capable of projecting a force-bubble around themselves that provides life support, resistance to the hazards of space, wind screening – and telekinetic flight. They are capable of accelerating themselves, and roughly half a ton of cargo, at several gravities without feeling a thing, and can easily carry a rider into orbit, to an attacking Great Beast, or to a nearby moon. When they’re linked with the energies of a powerful, high-level, character, their limits increase. They can accelerate faster, travel further, and resist greater hazards. A bonded character powerful enough to have few challenges left on his or her home world can explore the terrible depths of space, battle the dragons of the asteroid belt, and fly among the stars with their faithful steed. The Syfann may be a creation of some ancient geniuses or an evolutionary step towards leaving the planet – but taming one is the key to truly high-level adventures. Once used to people, they’re quite friendly and very loyal – but getting close to one for long enough to get it used to you can be quite a trick. Small colonies frequent the frozen tops of high mountains, the centers of icecaps, and other places where they are can fly and play safe and undisturbed. Worse, they can sense the presence of magic – and, until they’re tamed, will usually flee from it at enormous speeds. Still, with a Syfann as a steed-companion, a courageous hero can pursue the Great Beasts into the infinite night. The Seas of Space are a realm of beauty and terror, where blazing suns cast stark shadows across the space-coral reefs of asteroid belts, where fusion-driven “sharks” seek to devour sources of water and organic molecules – if possible, without the wasteful use of energy-blasts – and plasma dragons feed on solar flares. Life here is founded on metal and crystal and raw energy, tough enough to withstand millennia of meteor strikes, vast and powerful enough to withstand a perpetual struggle against creatures just as deadly. Fortunately, adventurers are small enough to be beneath the direct notice of the greater horrors – unless their power becomes vast indeed. Apparently drifting in the darkness, terrible accelerations concealed by incredible distances, the most powerful of the Great Beasts are many miles across – living “dungeons”, filled with terrible energies, populated with dreadful symbionts, parasites, organelles, and (occasionally) even a few descendants of planetary creatures clinging to life in survivable pockets. Surrounded, and often filled, with one of the most hostile of all environments the Great Beasts incorporate within themselves the stolen planetary magics of ages past. Larger than any one planet can support, and occasionally worshiped as gods, they populate the deeps of space – and, perhaps, occasionally meet between the stars in the oort clouds to meet and trade, as lesser entities might visit a marketplace or purchase the wares of a wandering merchant. To penetrate so far, and – perhaps – to divert the Great Beasts from your world for a few centuries or millennia would be an epic adventure indeed, even if no mere mortal is likely to be able to do too much to change to ecology of the galaxy. Occasionally, a group of the Great Beasts will find a young or isolated world which they have not touched before – and such worlds often invite assault, simply by virtue of having accumulated vast hordes of magic. Such a terrible occurrence will often be recorded by the planetary residents as an invasion of abominations which shatters their civilization. For the Great Beasts such an occasion will be fondly remembered as their equivalent of “that day last month when we found a big patch of ripe berries that no one was harvesting!”. 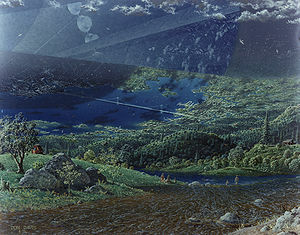 Fortunately, those humans who choose to live without much in the way of magic and heavy metal – the small tribes, the subsistence farmers, and similar folk – generally need merely hide when the once-every-few-centuries Great Beast scavenging for water and organic molecules comes calling; they need only defend themselves against mundane local menaces. You always need an answer to “how can the normal people live with all those high powered monsters around?” In this case, it’s pretty simple; swarms of undead only arise in the tomb-ruins of devastated cities, where no one is performing the proper rituals for the dead – and they must stay close to the place of their deaths. The greater horrors are not “around” – they are out THERE. In this case you also get some bonuses; a reason for why so few fantasy cultures go into space, a reason to have normal life be magic-less enough to be familiar, a reason for monsters sitting on piles of treasure in deep dungeons, a lack of a need to explain dungeon ecologies (since they’re full of inactive space-monster-constructs and undead), plenty of ruins and underground refuges, and a good reason why civilization does not spread out beyond its well-defended pockets. It provides a steady drain on magical gear (space monsters ate my magic sword! ), explains why high-level adventurers kids tend to be fostered in the courts of noble friends and such, rather than being kept with their parents or in their strongholds (and incidentally being loaded with magic and special advantages). High level adventurers may create strongholds in the asteroid belts – but they are combat outposts, not places to raise children and collect taxes. It also has the amusing consequence of transforming all the dungeoneering into astronaut training – and with the environment and ecology just too hostile for the planetary life-forms to colonize without a LOT of magic it provides a perpetual frontier to keep the high-level adventurers busy holding back the things that ravage their planet. Simultaneously, that also leaves the planetary frontier to the mid- level types – which is arguably as it should be.